An officer was injured after a naked woman led authorities on a 75-mile pursuit across Arizona Thursday morning. Officials say a Maricopa County Sheriff's deputy responded to a Shell gas station south of Phoenix after receiving reports from a naked woman saying she had been sexually assaulted nearby. Chief Deputy Ben Henry said the deputy arrived at the scene to find the woman disrobed and "distraught." As he attempted to assist her, the woman got into his vehicle and drove off. Henry said the deputy jumped onto the vehicle's running board, but was knocked off and suffered minor injuries. Witnesses pulled up and offered help, prompting the deputy to take one of their vehicles and initiate a pursuit. 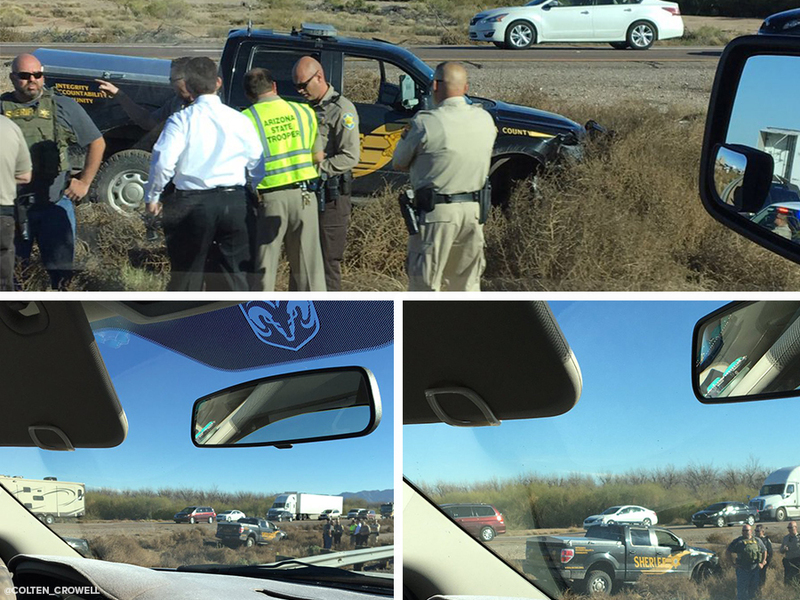 The deputy used a hand-held radio to alert local agencies to the situation, with Department of Public Safety, Pinal County and Eloy crews responding. The woman reportedly hit speeds above 100 miles per hour during the chase before stop sticks were deployed to stop the vehicle. Following the chase, crews deployed a stun bag to the woman's leg to keep her from stepping into the roadway. Henry said she was taken to a local hospital for treatment. Air15 video over the scene appeared to show the suspect on a stretcher being loaded into an ambulance. OPEN: I-10 East has reopened at Eloy. Delays are less than 1 mile. watch for officers still working in the median. Multiple charges against the female suspect are possible, according to Henry. Officials remain at the scene in Gila Bend to investigate the sexual assault allegations.